Blue Jay and Cardinal Feeders as Gifts: When you send blue jay or cardinal wild bird feeders you send two gifts: the feeder itself, and the moment it arrives. There's that knock at the door or the package on the porch. And the next thing that happens is your special someone's day becomes much brighter as they open a gift you will be remembered by years to come. Delivery of Feeders: At Hurley-Byrd, we do it differently and oversee every part of the process: from the buying of raw materials, to handcrafting the feeder, to the day your purchase arrives at the front door. We send freshly crafted feeders direct and bypass all the middlemen, which means better feeders and a better value. (Don't just take our word for it. Thousands of customers rate Hurley-Byrd "best value.") We believe in complete satisfaction and lasting value, too, which is why we guarantee a perfect feeder for you or your recipient , and also that your feeders will outlast all others available and will be enjoyed from the moment they arrive and for years to come. It's how Hurley-Byrd is changing how America feeds their wildlife. shame since the fly-though is a wonderful feeder attracting a wider variety of birds. are suited to either the small or large bird or for the birder who wishes to offer a lot or a little seed. 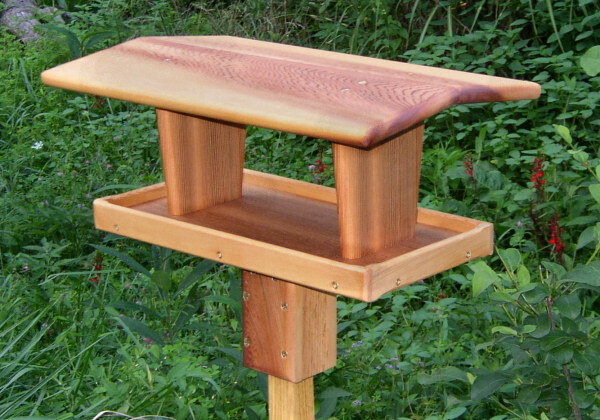 Any model is very attractive to Cardinals, Blue Jays and other birds who appreciate a platform feeder. Chose from our small Cardinal or larger Blue Jay models as a patio, pole mount or hanging feeder. 1.) 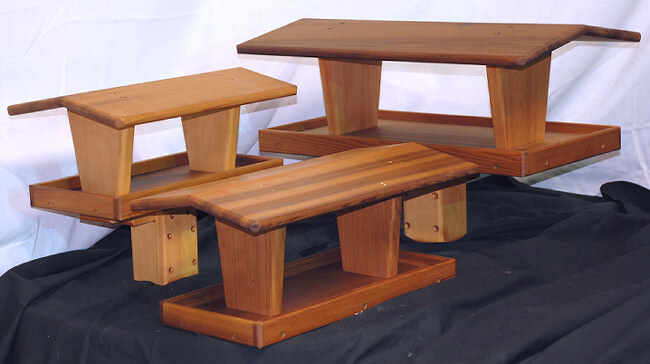 Sturdy base plates and extra thick vertical roof supports for years of durability. 2.) 3/4" Matched lumber roof halves of superior beauty tightly matched at the peak for no leaks. 3.) 1/2" thick railings to hold up to years of bird talon activity and abuse. Solid Brass and Ceramic Coated Screws - No inferior staples, nails or brads found anywhere. 2.) Brass and Ceramic Coated Screws will not corrode like nails, staples, or inferior fasteners. Sturdy Pole Mounts and Poles - Built Hurley-Byrd tough for years, if not decades, of use. Integrally Installed and Secured Hanging Ropes - Clean design and strong. A Hurley-Byrd Innovation. Our Smallest Fly Through - About the size of "their" large. feeder for setting in front of a window or spot-filling elsewhere in their feeding station. feeder our own cardinals visit first thing in the morning and last thing at night. 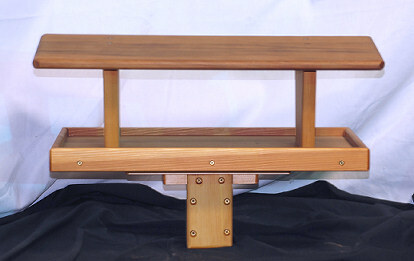 Feeder Dimensions less mount: 16" in length, 11" in width, 7" in height. Mount adds 6" in height. Light Assembly Required - Attach mount with 4 screws if purchased with a Small Pole Mount. Very Easy! The Blue Jay - A Wonderful Medium Sized Feeder. A Medium Sized Fly-Through - One of our most popular feeders. The Blue Jay was aptly named for being able to readily accommodate its namesake. this is the feeder. It holds 1 1/2 pounds of seed and is also an excellent fruit, nut or whole peanut feeder. 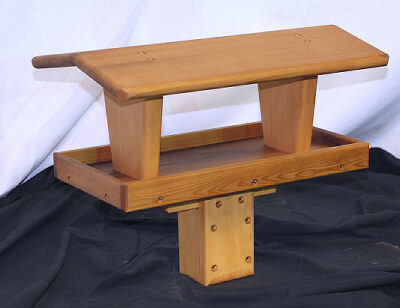 Feeder Dimensions less mount: 20" in length, 11" in width, 9" in height. Mount adds 6" to height. Light Assembly Required - Attach mount with 4 screws if purchased as a pole mounted feeder. Very Easy! The roof measures 24" in length, 16+" in width and its overall height is 9+". Either Small or Large Pole Mounts will add approximately 6" to the overall height. feeding station) or installed on your existing 4x4 post with our all new Modified Large Pole Mount. 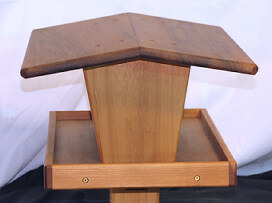 For those who will be installing a new 4x4 post to erect this feeder, read this guided article. such as Blue Jays (of course), Cardinals, Mourning Doves and enjoy all your other seed eating birds too. feeders, adding bird treats such as dried fruits, nuts, berries, etc... is very simple and appreciated. mount with its 4 brass screws when purchased as a pole mounted feeder. Each is Very Simple! Adds a whole new level of feeding to any pole mounted bird feeder. Fits our Small Poles. Comes with attached hanging rope for placement anywhere. Perfect for hanging from a deck or patio overhang or nearby tree limbs. For Hanging Feeders, use the drop down menu to left and order the desired quality of "Hanging Style". For Pole Mounted set-ups, use the same menu and order the "Patio Style". Then add the desired accessories to complete the feeder. You will add the number of Small Pole Mounts, Poles and Seed Trays (tray shown below) as desired. Extra Large Blue Jays come two ways. 1) As a Patio Version. Meaning, no pole mount, etc. Just the feeder for you to set out as desired. 2) The more popular version is our Pole Mounted option. For Pole Mounted feeders there are two options. A) The use of our Small Pole Mount which will allow you to purchase a matching Pole and Seed Catcher Tray. the feeder on top of YOUR 4x4 post. For the feeder alone, order the Patio Version. Poles and Seed Trays (tray shown below) as desired. There is no Seed Tray for the 4x4 option.